Dementia 13 was the result of a 9-day shoot, from a script written in 3 days, from a story idea that was produced overnight. And yes it looks it, though that isn't entirely a bad thing. It's a cult movie, written and directed by Francis Ford Coppola (before he began using his middle name), supposedly at one time widely believed to have been his first film. All I know is, by 1983 at the latest, that myth was dispelled by Michael Weldon, in his great Psychotronic Encyclopedia of Film. Now everyone knows that Coppola actually worked on a couple of nudie pictures before this one, though it appears only one of them -- Tonight For Sure -- was completely his. Still, it is his first "legitimate" film. 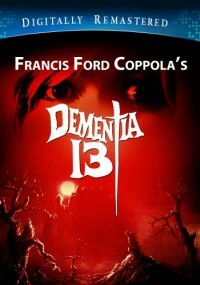 Weldon says, "With a great trick ending, some truly shocking gory axe murders, and lots of inventive photography...[Dementia 13 is] a minor horror classic from a master filmmaker." Now, you can go with that -- or you can read on. Several years ago, young Kathleen Haloran drowned in the pond on her family's Irish estate. Lady Haloran seems to think of little else and her three sons are all affected by the tragedy in different ways. The eldest married a gold-digger and the youngest is plagued by nightmares. The middle brother, Richard, appears to be the steadiest of the lot, and he is about to be married to a pretty young thing named Kane. 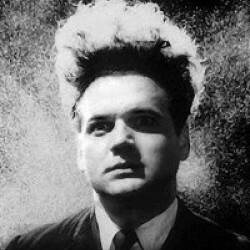 But Richard is a sculptor and when a creepy shrine to Kathleen is discovered, he seems to be the most likely culprit. Meanwhile, anyone who gets near the solution is hacked up by a shadowy figure wielding an axe. One of the murders -- the most gruesome one, in fact -- wasn't shot by Coppola. It was ordered after producer Roger Corman saw Coppola's finished film and decided it needed more horror. If it weren't for that, the body count would be cut in half. So it's safe to say the cult following for this film isn't based on violence. I'm going to go out on a limb and say it isn't based on the clever logic of the screenplay, either. The killer only shows up when some new clue is revealed, and it's as if the revelation itself is psychically transmitted to him so that he can grab his axe and teleport to the site to do his murderous business. That would have been an interesting movie! So it must be Coppola, right?, him and his "inventiveness." Well, if by "inventive" you mean "awkward," and if there are a lot of people who enjoy that sort of thing, then I suppose that could explain it. The movie opens with a high-angle shot of a bickering married couple on a dock. The angle adds nothing to the scene, except a bit of queasiness. Nor is it followed by anything I could identify as noteworthy. That is, unless you count a bizarre scene in which it appears as though a woman climbs through a window -- from a hallway. And of course as screenwriter, Coppola "invented" the dialogue, which even the actors complained was "stilted." No, I think this film's following must be related to Kathleen, the poor little girl who drowned. We see her alive in a flashback, but more importantly we see her dead. Supernaturally dead, it would appear, for she looks as she did in life; she might simply be sleeping. Her presence literally haunts the film, and when you include the shrine and its unlikely location, she overshadows all the rest, an eerie reminder of what horror films are all about: wreckage, despair, and the loss of innocence. The ending encapsulates all this in a single violent act. For Kathleen, Dementia 13 deserves its place as a cult film, but that comes with its own warning: Don't expect much in the way of traditional entertainment.